B2B influencer marketing rarely (if ever) relies on Instagram celebrities, and some claim it’s much harder for B2B marketers to find the right influencers than it is for popular B2C brands. Typically, there are not a lot of mainstream influencers that cover B2B topics, and things get even more complicated the more niche your product is. For example, if you’re selling CRM for lawyers, how many people out there have a blog about this particular topic? You might get disheartened before you even start, but don’t be. While finding the right B2B influencer is harder than just typing “beauty blogger” in an influencer marketing tool and waiting for the program to select the best ones based on your filters, there are proven ways to find that special person. Instead of calling it quits before you even start, and just sticking to traditional trade shows, PR and other tools in your marketing toolbox, read the tips below. As basic as it sounds, using a search engine like Google is always the first thing you should do when trying to find B2B influencers. The first couple of pages are likely to give you the most quality content to start with. To prevent yourself from going down the rabbit hole, make sure to note down everything important, every site you find and contacts immediately when you are on the site. Personally use Ninja Outreach or Buzzstream for this – a neat extension that enables me to just send all contacts I find directly to the database. Googling can only get you so far, as search engines tend to focus on providing only the most relevant content, and not all. If you want to know what anyone on the internet has been writing on a specific topic, monitor the name of your brand, your competitors and specific industry terms in a media monitoring tool like Mediatoolkit. For example, since our target influencers are PR bloggers, we monitor industry terms and popular hashtags. 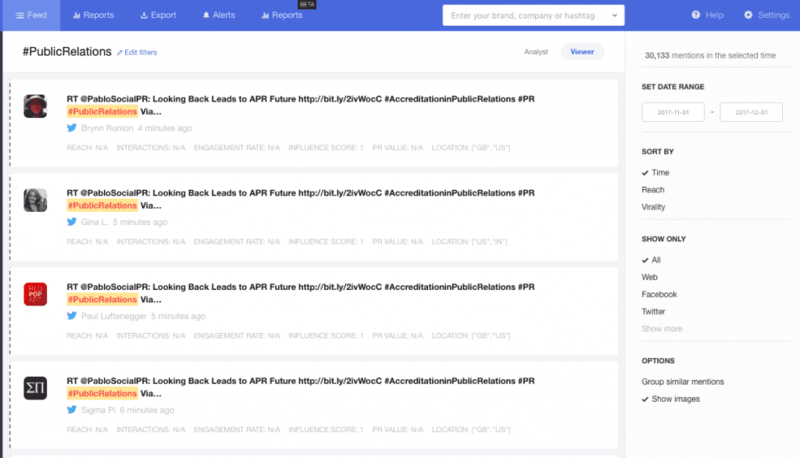 Mediatoolkit will give you an overview of who has been writing about your brand in the recent couple of months, and more importantly, about competitors. If there are relevant texts, tweets or posts, you will find them. One other tool we use is Ahrefs, which is an SEO tool that backtracks links to any site to the site where they were originally posted. For example, you can see if someone linked a keyword in their blog to your competitor’s site. Typically this will either be influencers or journalists, so it’s great way of finding them. They go back in history quite a lot, so you get even more historical search than with media monitoring. One major source of influencer data for B2B marketing is Buzzsumo, which shows the most shared content on a certain topic. If I input “content marketing” as a term, it shows the top shared articles in the last 5 years. Amazing for finding influencers. Alternative is to use Inkybee, another tool specialized for finding blogs. Say you do have a CRM built specially for a niche group of lawyers, and all the previous steps yielded nothing. While there is doubtfully a lot of influencers obsessively writing about these types of tools, there are definitely blogs, comics and social media influencers that write about law in general. 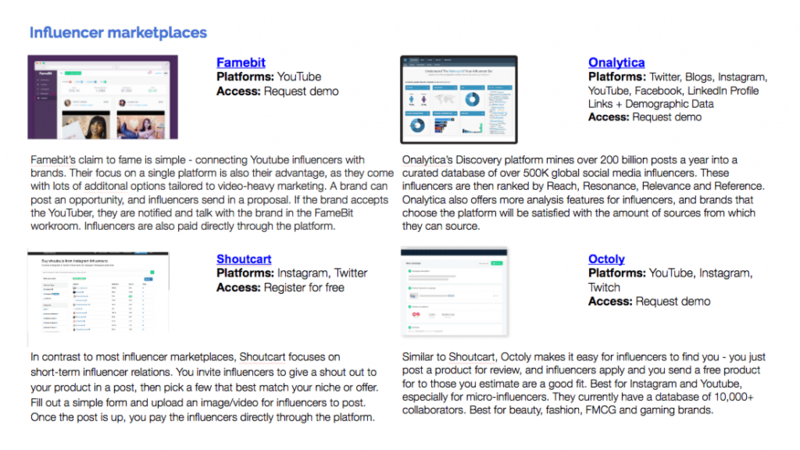 Find them using one of the tools in our list of top 100 influencer marketing tools. These are various tools that have databases containing thousand, sometimes even millions of influencers. You can find the download link at the bottom of this article. Have any other tips or tools to recommend? Let us know in the comments. We care about your privacy. Let us know if you'd like more informative from us. No spam, we promise. I agree to be contacted for feedback. I want to subscribe to Mediatoolkit's PR industry newsletter.